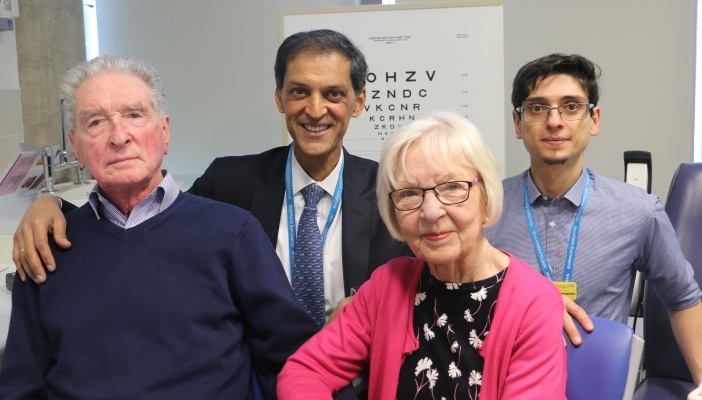 A man in his 80s and a woman in her 60s, who both have advanced wet age-related macular degeneration (AMD), have regained enough sight for reading after successfully undergoing a revolutionary treatment with stem cells. AMD causes changes to the macula, which can lead to the loss of central vision. The new treatment involved the implantation of a specially engineered patch of stem cells under the retina to treat people with sudden and severe sight loss from wet AMD, in an operation lasting one to two hours. The two patients went from not being able to read at all, even with glasses, to reading 60-80 words a minute with normal reading glasses – results that exceeded the expectations of the scientists carrying out the trial. The treatment is the first example of a complete engineered tissue that has been successfully used in this way. The breakthrough comes from the London Project to Cure Blindness, a collaboration between Professor Pete Coffey of University College London and Professor Lyndon da Cruz, a retinal surgeon at Moorfields Eye Hospital. The scientists hope that this successful trial will lead to an affordable therapy that could be made available to NHS patients within the next five years, and to also use the patch to treat dry AMD. Douglas Waters, 86, from Croydon, London was one of the two people who received the treatment. He developed severe wet AMD in July 2015 and received the treatment three months later in his right eye. The results of this study are published in the journal Nature Biotechnology.